Production at Volkswagen's Chattanooga assembly plant. SHANGHAI -- For Volkswagen Group, one of the visions for future manufacturing includes mobile machinery, with robots cruising around factories and deciding on their own what they’ll do next. A senior VW executive involved in implementing Industry 4.0, the name for the integration of big data with traditional manufacturing, told a conference last month in Shanghai that the carmaker is looking at when robots will be mobile and capable of acting more independently. 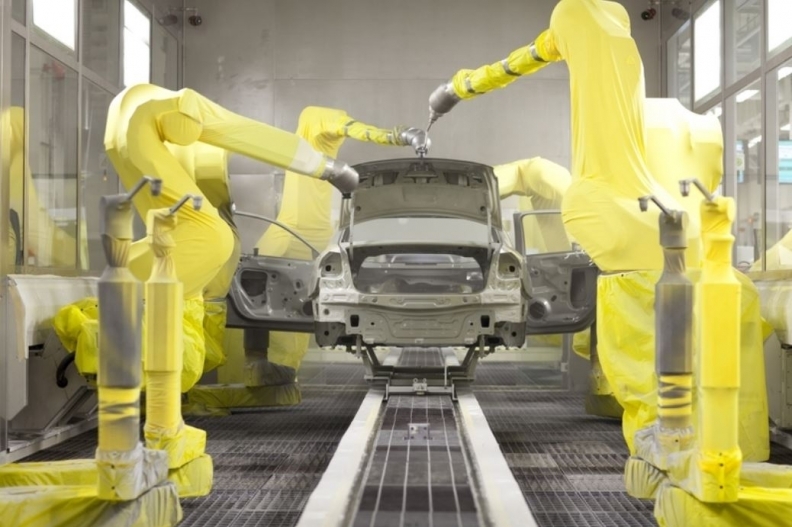 “What we are discussing in the moment is robot production, and how far away is it that robots are not fixed,” said Fabian Fischer, head of internal processing in VW’s research unit for materials and manufacturing. “So if you have a robot on wheels and electricity on board, and the robot is not fixed, and the robot can decide now I make this, and afterward I drive to make this, and the robot can decide what he has to do,” he said. Fischer told the conference it was “just an idea,” but it was also the first example he offered in response to the first question at the conference, about what VW wants from its machinery suppliers to help implement 4.0. Fischer’s wide-ranging presentation offered a glimpse into how one of the world’s biggest carmakers sees Industry 4.0 changing how it makes vehicles. Serious 4.0 work for VW only began in 2013, Fischer said, but it’s progressing quickly. The company has finished a prototype car where each part has RFID chips or similar technology for traceability, he said. That development is more helpful for maintenance but Fischer said that production-related advancements will be coming. Given the normal three- to four-year development period for new research, work on 4.0 is still in the early stages, he said. A big motivator for VW’s 4.0 effort is managing the increasing complexity of manufacturing -- 115 factories worldwide with 12 different brands and 280 models across the company -- and being faster to market, he said. The first Volkswagen Golf had a nine-year life cycle, from 1974 to 1983, but the Golf 6 had a four-year life cycle and in some countries like the U.S. VW cars have a two-year life cycle, Fischer said. The increasing complexity of electronics in cars also is pushing Industry 4.0, he said. Beyond visions of factories with mobile robots, he also said there are more mundane aspects of 4.0, such as the “networked factory” that collects data to help with internal logistics and resource efficiency. For VW’s customers, there’s potential for more individual choice in what have been mass produced cars, he said. But visions of the networked factory also bring up worries about network security and losing control of information, a point that speakers at the VDMA forum acknowledged. “Will we lose our jobs, will there be secure information technology, will you lose control of the machinery?” he said in opening remarks at the conference. Reinhard Schiffers, head of machine technology with KraussMaffei Technologies GmbH, said his company takes IT security seriously and is aware of concerns from customers about losing control of production data. “In the future we will have to make sure that the information we are sharing with our customers is safe,” he said. Schiffers said Industry 4.0 remains not so well defined. At one level, he said it means taking the data extraction and analysis techniques developed by “cyber companies” and applying that more deeply to manufacturing. He said an operator could tell machines when production needs to start, and the machines will coordinate among themselves to get all the materials and components ready. Kühmann said the Shanghai conference was only part of the “start of a conversation” about 4.0, and he said the European industry would have more specific presentations at another event in Germany later this year.